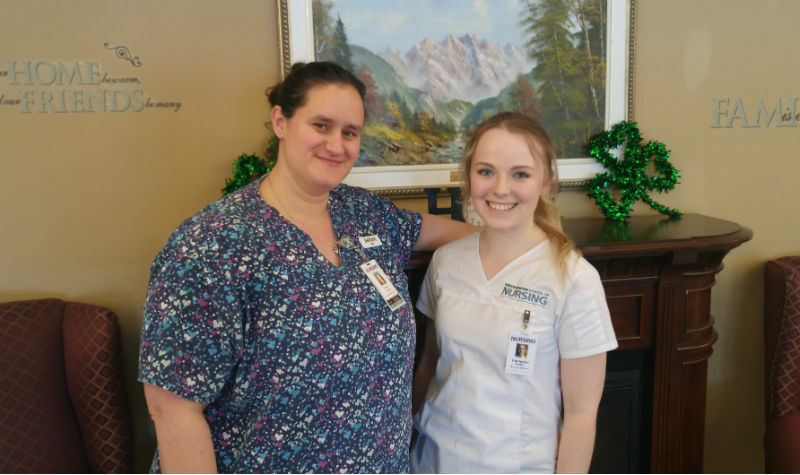 Clinical instructor Sarah Towns (left) and Trent University nursing student Katherine Ledlie (right) are pictured at Springdale Country Manor on March 11. SPRINGVILLE, Ont. – A clinical instructor overseeing Trent University nursing students doing an eight-week placement at Springdale Country Manor says the partnership is providing the students with opportunities to enhance their skill sets through hands-on experience working with the Peterborough-area long-term care home’s residents. This is the fourth year Sarah Towns has been overseeing nursing students during their placement at Springdale. Currently, two groups of eight students are coming to Springdale twice per day, from 7 a.m. to 1 p.m. and from 1 p.m. to 7 p.m., on Mondays and Tuesdays. The students are in their second semester of their first year, and this is their first clinical placement. Students are mainly learning about the work personal support workers (PSWs) do. “Their role here is to learn the work of a PSW but also how to interact with residents, learn about different behaviours and the different conditions people have,” Sarah tells The OMNIway. Sarah says providing nursing students with hands-on experience in a long-term care home is valuable because long-term care settings are quite different from acute-care environments. “Long-term care is interesting because this is the residents’ home, and you’re essentially coming into someone’s house, and you get to know people on a much deeper level than you would in a hospital, where people are always coming and going,” she says. Sarah adds that the Springdale Country Manor team has always provided Trent nursing students with enriching experiences. “I know a lot of the people here, and it’s nice to come back and see them again, and the staff here are great – they are absolutely fantastic,” she says. The students have been doing their placement at Springdale since Feb. 4 and will continue coming to the home until April 1.